Coveted for its wildcat exotic looks, the Bengal prowls like a small leopard with its sleek, muscular body, oval eyes, broad nose, strong chin and wedge-shaped head. Its hind legs are slightly longer than the front legs, yielding a “stalking-like” gait. TICA recognizes 13 different coat colors in competition, ranging from brown tabby and seal lynx point to spotted and marbled patterns on its short to medium coat that feels silky to the touch. Females weight between 6 to 12 pounds and males average between 10 to 12 pounds. The Bengal put the "b" in busy. These cats are active, alert and agile. They study the actions of their people and learn how to open cabinets, doors and even windows. They are capable of scaling walls, roosting on top of refrigerators and other high places in the home. Despite its rising popularity, the Bengal is definitely not a cat for everyone. They fare best with experienced cat owners willing to devote time each day for interaction. Bengals demand attention. They are quite talkative, capable of making a wide range of vocalizations from chirps and chortles to squeaks and howls. Some growl when they eat. Bengals thrive in active households. They love to play long games of fetch, walk on leashes and play in water dishes and bathtubs. Show-quality Bengals can cost $2,000. Bengals take up to two years to reach maturity. Bengals are ideal candidates for clicker training. They like shiny objects and may steal them and hide them. A new and controversial breed, the Bengal is fast growing in popularity, due in part to its wildcat appearance. The Bengal began as a hybrid breed, created by crossing the Asian Leopard Cat with the domestic cat. 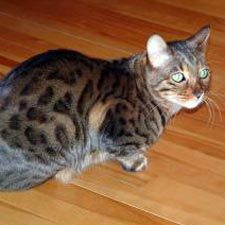 The first “pet leopard” is traced back to Japan in the early 1940s, but the first appearance of Bengals in the United States was in the 1970s. As a breed, Bengals were first exhibited in cat shows in 1985. Today, The International Cat Association ranks the Bengal as its most popular breed, well ahead of runner-up Ragdoll with more than 60,000 Bengals registered with TICA. However, the Cat Fanciers Association, the world’s largest cat breed registry, does not recognize the Bengal as a breed. To compete in the show ring, the Bengal must be at least a fourth-generation descendant of a crossing between the wild Asian Leopard Cat and a domestic cat. The goal is to maintain the “wild look” with a pleasing domesticated personality. Any Bengal who displays paw swatting or other signs of aggression toward a show judge is disqualified from competition.